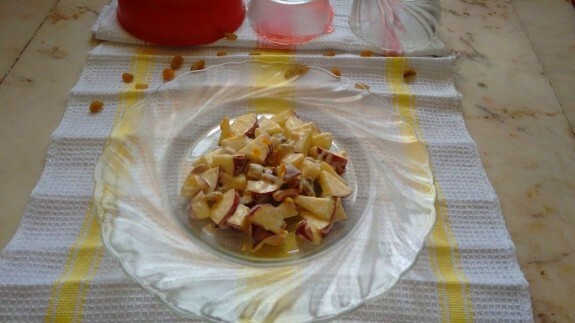 Dressing with Cinnamon and orange peel give a fantastic aroma and accent to the crisp apple salad. Try to make this recipe at home and you can start your day with this refreshing salad to make your mood joyful throughout the day. 1. In a large bowl, add apples, cranberries, nuts (almonds, cashew nuts) and raisins. 2. In another bowl, add mayonnaise, lime juice, ground cinnamon, honey, orange peel and pepper and mix it well. 3. Pour this mixture on the apple nuts mixture and toss to coat. Refrigerate it for 1 hour before serving.